Good news! If you can't get enough of those lovable football fans from Green Bay, Wisconsin—the people Drew called "the Trekkies of the NFL. Fat. Slovenly. Unjustifiably arrogant"—you'll have even more of them on your television soon enough. They showed up in their best, and sometimes bizarre, green and gold to show their allegiance to the Green Bay Packers and to audition for a reality show about cheesehead fans. Producers from Style Network plan to shoot a pilot about the Packers faithful and met with about 80 fans Thursday night at the Stadium View bar near the team's headquarters at Lambeau Field. Casting associate Kjerstin Johnson says they're looking for the most energetic, loudest and passionate fans they can find. The Green Bay Press-Gazette says producers plan to film a pilot before the end of the year. Fans wore cheeseheads, team jerseys loaded with Packer buttons and plenty of green-and-gold jewelry to the audition. The Style Network's shows include "Big Rich Texas", "Jerseylicious" and "Tia & Tamera." Aaaand football fandom jumps the shark. 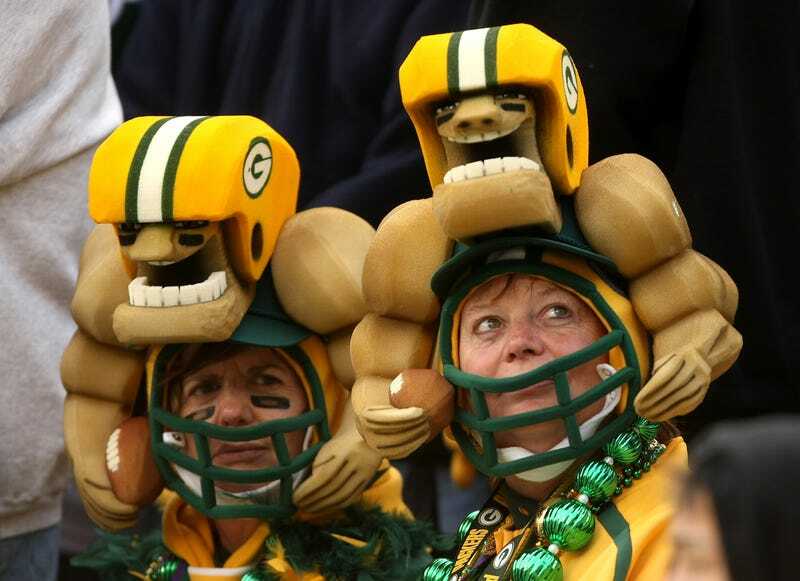 The Green Bay Press-Gazette called the audition a gathering of "rabid cheeseheads," which is an appealing image and probably won't give anyone nightmares. Packers fans can embarrass themselves on TV whenver they want now, instead of waiting for Sundays, and should feel proud that that the latest national television network dip into the regional cesspool has alighted upon Green Bay. Should be just as good as—if not better than—"Jerseylicious."